This labor of love is made possible by Arbing Editions. The master printer invited us to make a special lithograph using old hand methods of production. This piece took more than 120 hours to produce. Six colors were used to make the piece and each color required a plate to print the piece. Each piece is on Rives BFK white and bears the press chop mark and printers stamp in the back. 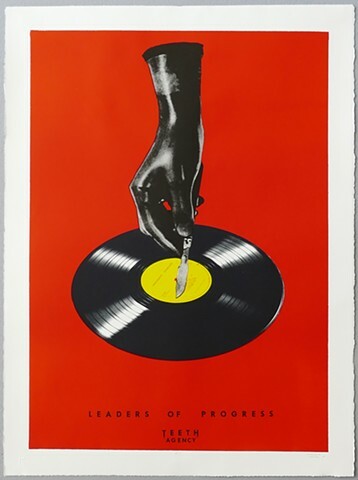 Signed and numbered edition of 20. This edition will be split to 10UK and 10 US for availability. Measures 22" x 30 "
As the year ends Teeth Agency leaves you with this meditative album and calendar welcoming 2019. The funeral directors salesman sample catalog features beautiful caskets for all faiths and beliefs. To the right of the casket is a tiny meditative calendar that is both functional and dysfunctional. The 25 min soundtrack that accompanies our 2019 meditation calander featuring Hello Skinny / ESKA / and Shabaka Hutchings provides a perfect escape from the sickely sweet sound of xmas . Plenty of white space to project your hopes for each month. A spectrum of 12 caskets to review and ponder—one for every month. Say goodbye and say hello—when the end is near a new beginning awaits . 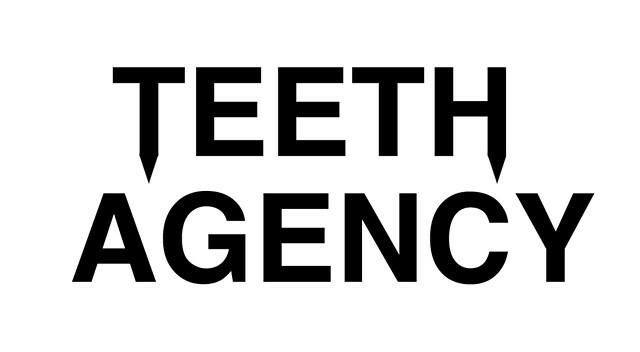 Happy Holidays from Teeth Agency. Teeth Agency is releasing a limited edition of 20 ‘Sea Shanty’ hand numbered 7” vinyl. This haunting collection of songs is described as underwater sea organ music. Moods of a final decent into murky ocean waters as a final goodbye poem. Similar in sentiment is side B with the lo-fi Casio prayer ‘Take me Down’. The pairing is enveloped in a sleeve of deep sea photographs taken by photographer Nathan Foster. His discovery of a sunken ship lead him to the ships infirmary with a stark pile of human bones and the back image a striking ships dead eye looking like deaths head above the choppy waters. Personal, haunting and melancholic —this body of work is a single pressing presentation that is soon to sell out. 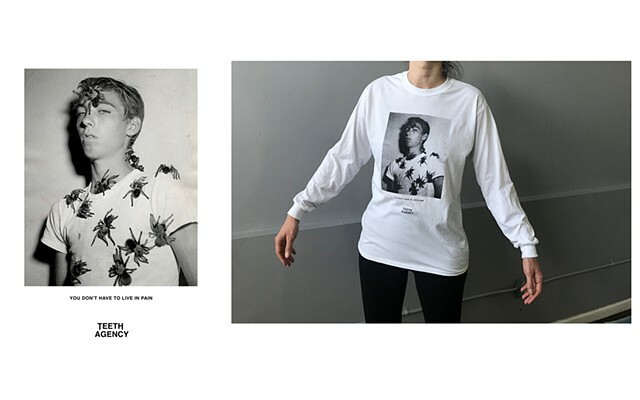 Teeth Agency has made a limited edition (30) thick cotton Gildan long sleeve shirts. They bear the slogan 'You don't have to live in pain' underneath our spider boy. Please specify S, M, or L when ordering. 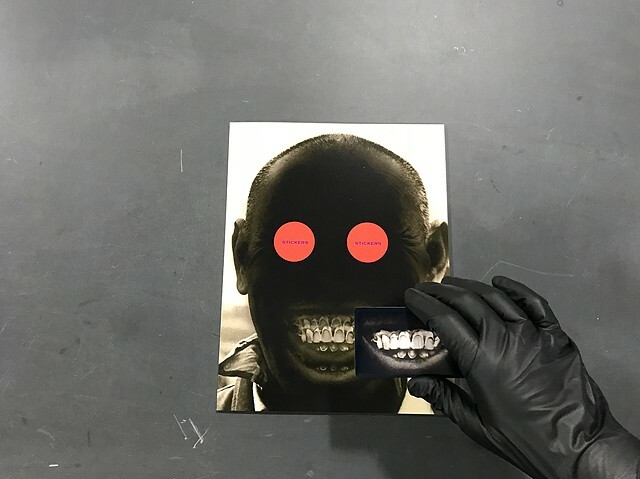 Teeth Agency has released two tracks (Death Whistle and Fly Porridge) from its forthcoming album ‘Chucky’s Terror vision. To celebrate this release we have made a very limited edition of 10 7” vinyl . The 10 copies are split to 5 U.S and 5 UK only! Each record is hand numbered 1-10 and comes with a special skull cyanotype print on heavy watercolor paper signed inside. 44-page premium magazine with music USB. Comes with additional unique ephemera. Limited Edition of 50. 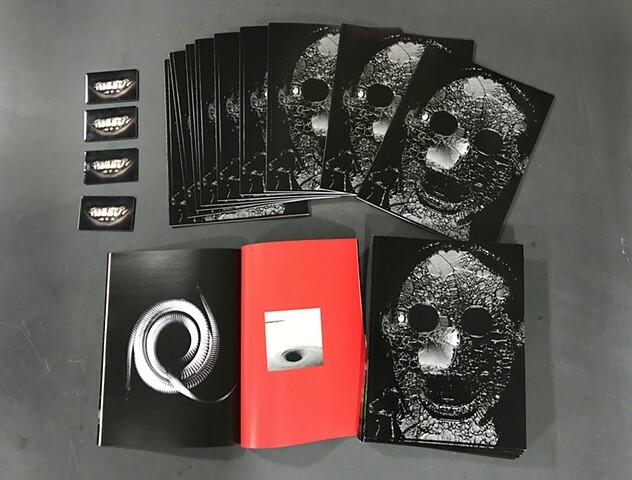 The Lizards Garden is Teeth Agency’s second release. The work is minimal and hard. Imagine waking up in a country after being kidnapped. You finally make your escape and get in a car. You are driving and it is getting dark. All you can see is the road and you turn on the radio. The music seems familiar but you can’t quite place it—it gives no clue of where you are. You look in the mirror only to find that you have had surgery and your face isn’t what you remember. This is what The Lizard Garden sounds like. 36-page premium magazine with music USB. Comes with additional unique ephemera. Limited Edition of 50.